Romances de los Señores, poem #55. Cantares Mexicanos, poem #5 and #40, and Romances de los Señores #52. Note: This poem is found three times in the original manuscripts, with some variations. Because of that we can conclude it was a popular poem. In one version it has three verses, four in another, and ten in another. It is a call-and-response poem, a common form in Aztec flowersongs. Interspersed between some of the stanzas, are verses in which another singer or chorus answers the poet. The flowersongs were written down as the scribe heard them performed, two generations after Nezahualcoyotl’s death. The response verses were probably not part of the original poem, and are not included in my translation. 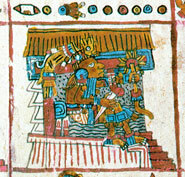 Yoyotzin was Nezahualcoyotl’s nickname. in the market you appear. Note: The Atamalcualiztli ceremony included dances and deity impersonation. Its performance served to rejuvenate corn. It was celebrated every eight years on the day One Flower, when the cycle of the planet Venus crossed the 365-day sun cycle. According to the mythological story, on that day during the Creation epoch or First Sun, Tlazolteotl, the Earth Mother, gave birth to Cinteotl, the corn deity. 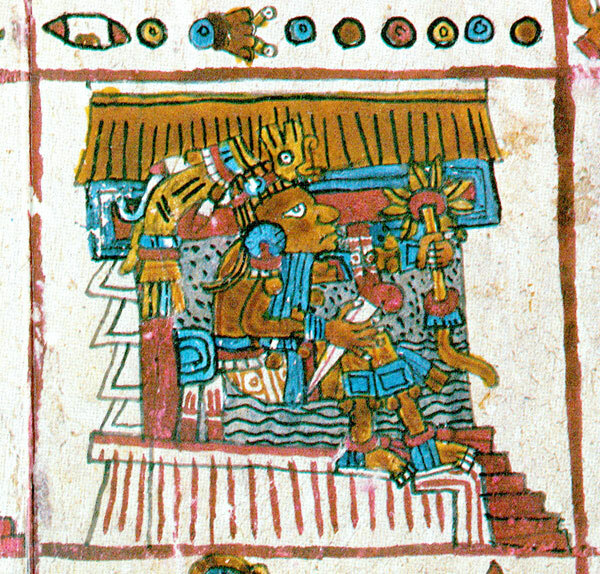 Cinteotl and Quetzalcoatl are closely identified. 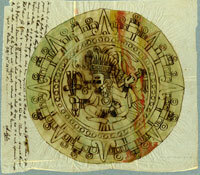 Cinteotl was the Morning Star (planet Venus), and Quetzalcoatl became the Morning Star in the current epoch or Fifth Sun. tilili yyao ayaue o ayyaue. Text © 2008 John Curl. All rights reserved. que viva en la indigencia. ¿son acaso tu corazón. Dador de la vida? Do you know where I can find the Nahuatl text for the poem that starts, “All the earth is a grave...”? Thank you. Brinton took it from ”Tardes Americanas”, by Granados y Galvez, pp. 90-94. (Mexico, 1778). The original is actually not available in Nahuatl, but in Otomi. Nezahualcoyotl and other Aztec poets also wrote in this language besides their native Nahuatl. I hope that helps you somewhat, or at least points you in the right direction for further study. John Curl.